Experience One of the Best Houston Airport HotelsThe smoke-free Holiday Inn Hotel Houston - Intercontinental Airport offers guests the best in Texas hospitality. 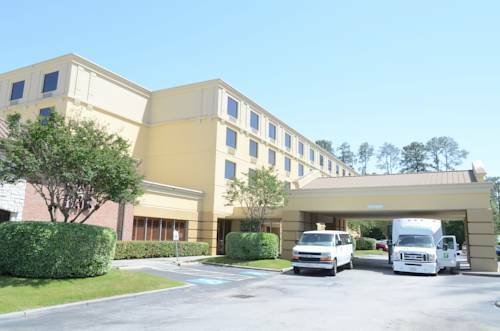 This Houston airport hotel's central location, easy access to I-45, US-59 and Sam Houston Tollway makes it easy to get anywhere in the city.Corporate travelers appreciate the first-class business services in the 24-hour Business Center, the free Wi-Fi access and the flexible meeting facilities we offer. Being near Halliburton, Continental Airlines, ExxonMobil and Richie Bros. Auctions is another reason why business travelers prefer our hotel in Houston, TX. Don't forget our complimentary shuttle can get you to those early flights on time at Houston (IAH) Airport.Our hotel's leisure visitors love a location that offers easy access to the most popular attractions in Houston. No Texas vacation is complete without catching one of the professional sports teams in action. Looking for a great round of golf? Check out Tour 18 or Redstone for a memorable day. And did we mention world-class shopping is as close as Deerbrook Mall, thanks to our courtesy shuttle!Texas hospitality and our Houston hotel's first-class service create a memorable experience for our guests. From an over-sized outdoor pool to unrivaled recreational facilities to the delicious country cooking in our restaurant, you'll feel completely at home. See for yourself why our hotel in Houston, TX is one of the best. Hot Biscuit is a family owned, 24 HR diner. They serve breakfast, lunch and dinner. Don't miss a chance to relax and unwind in the comfortable and inviting Good Eats Bar in our hotel in Houston, TX. You'll find weekday Happy Hour specials, good conversation and friendly faces while you relax after a busy day of travel or meetings. Happy Hour Monday - Friday, DJ and Dancing. Medium size ballroom sectionable into two rooms. Medium size meeting room. Close to lobby. board room size meeting room. For over 40 years, Houston golfers have enjoyed the challenging par 72 layout which is ideal for all golf enthusiasts whether accomplished or novice. 37 bunkers and numerous water hazards will certainly test the shot-making skills of all golfers.